When you’ve been going to car shows for as long as you can remember and your dad is a top class fabricator and welder, it’s no surprise that you end up having a pretty cool ride for your first car. Reece Lougher hasn’t even got his licence yet, but with help from his dad Gareth and a few good friends, he’s racking up the miles – and supervised hours – behind the wheel of this HZ Sandman ute. Where did you find the ute? We found it on Gumtree. It popped up pretty cheap, so we went down and had a look at it – we thought it would be cool to have a ute as well because we were already building the panel van. It had been sitting in the shed for 20 years or so and had low kays. It was originally just going to be a bit of a tidy up, but then Dad got a little bit attached to it and started going a little bit more into it. 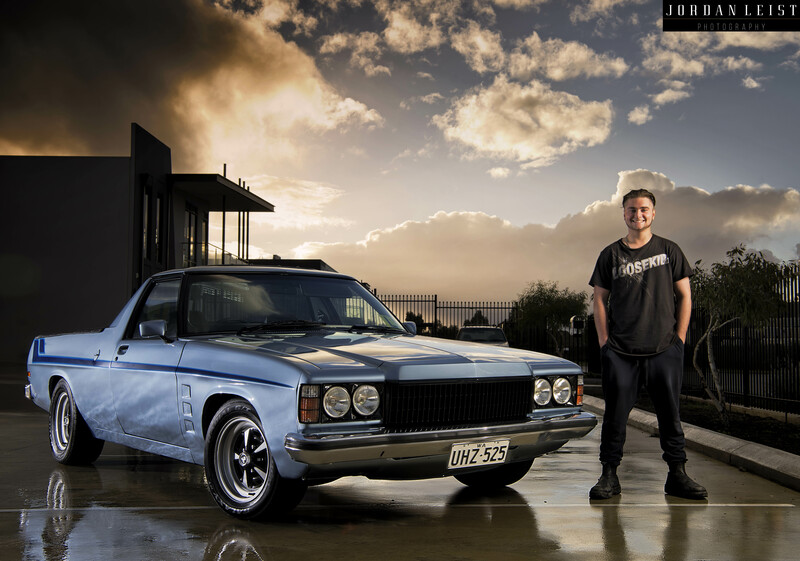 It won a trophy at the WA Hot Rod & Street Machine Spectacular, so it must be pretty tidy? We ended up taking the body off and repainting all the chassis, Mark Cook repainted it in the original Atlantis Blue and Phil Wall re-did all the trim. It was all done in-house at my dad’s business, Elite Wheel Services. What’s the running gear in it? It’s got a 253 in it and a Supra 5-speed that came with it when we bought it, we just tidied up the conversion a bit and made the crossmember a bit neater. It’s the original motor, but it’s been completely rebuilt by another good friend, Lennard Vidot. The block and heads are original, but all the bolt-on parts have been replaced, and we put an Edelbrock manifold and 600 vac sec Holley on it. Was it a long project? No, the whole thing was done in six months. Tell us a bit more about the panel van. We’re not doing anything that will bastardise the originality of the body. The plan is to do it up to show standard then after a couple of years we’ll take it back to original. We’ll do a chassis to elite level, and once we finish showing it, it will go back on to the original chassis. Your dad is one of the best fabricators around, are you following in his footsteps? No, I’m doing an automotive electrician’s apprenticeship. I wanted to be a house electrician at first, but I wanted to be around cars at the same time. I asked Dad about being a fabricator and welder, but he said: “Do something I don’t know how to do, I can teach you that stuff later.” He put me on to Sav Morabito from Sav’s Auto Electrics, and I did work experience one day a week for all of last year. While you were still in high school? I came to work every Monday and went to school the other days of the week. I was in Year 10 at the time, but we talked to the principal, and he allowed us to do it as long as I stayed on top of my work. And you managed to still pass? Yeah, passed everything, which was good. Now I do four days of work and one day of TAFE.